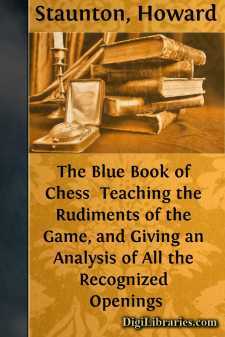 DESCRIPTION OF THE CHESS-BOARD AND MEN—ARRANGEMENT OF THE MEN—THE KING—THE QUEEN—THE ROOKS OR CASTLES—THE BISHOPS—THE KNIGHTS—AND THE PAWNS—THEIR MOVEMENTS, POWERS, METHOD OF CAPTURING AN ADVERSE MAN, ETC. DESCRIPTION OF THE CHESS-BOARD AND MEN. The game of Chess is played by two persons, each having at command a little army of sixteen men, upon a board divided into sixty-four squares. The squares are usually colored white and black, or red and white, alternately; and custom has made it an indispensable regulation, that the board shall be so placed that each player has a white square at his right-hand corner. A King A Queen Two Rooks, or Castles(as they are indiscriminately called) Two Bishops Two Knights And each of these Pieces has his Pawn or Foot-soldier making in all an array of sixteen men on each side. On beginning a game, these Pieces and Pawns are disposed in the manner shown on the foregoing diagram. The King and Queen occupy the centre squares of the first or "royal" line, as it is called, and each has for its supporters a Bishop, a Knight, and a Rook, while before the whole stand the Pawns or Foot-soldiers in a row. (To prevent a common error among young players, of misplacing the King and Queen on commencing a game, it is well to bear in mind that at the outset each Queen stands on her own color.) The Pieces on the King's side of the board are called the King's, as King's Bishop, King's Knight, King's Rook; and the Pawns directly in front of them, the King's Pawn, King's Bishop's Pawn, King's Knight's Pawn, and King's Rook's Pawn. The Pieces on the Queen's side are, in like manner, called the Queen's Bishop, Queen's Knight, and Queen's Rook; and the Pawns before them, Queen's Bishop's Pawn, Queen's Knight's Pawn, and Queen's Rook's Pawn. MOVEMENT OF THE PIECES AND PAWNS,AND MODE OF CAPTURING AN ADVERSE MAN. A knowledge of the moves peculiar to these several men is so difficult to describe in writing, and so comparatively easy to acquire over the chess-board, from any competent person, that the learner is strongly recommended to avail himself of the latter means when practicable: for the use, however, of those who have no chess-playing acquaintance at command, the subjoined description will, it is hoped, suffice.